Brian Arthur creates sea life bronzes that bring the joyful activity of nature to your home. With their elegant simplicity of line and smooth rich patinas, they capture the varied moods of the natural world. 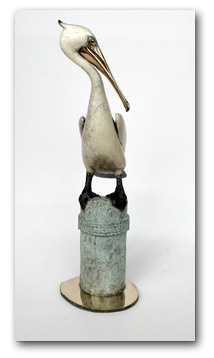 The best pelican sculptures and otter sculptures in bronze by any artist working today! With the emotional sympathy of a true animal lover, Arthur brings a touching warmth to his line of otter sculptures, from the smallest pieces that fit in the curved palm of your hand, like the incredibly sweet new piece "Small Sea Otter and Baby", to his stunning "Large Sea Otter with Baby", a magnificently scaled bronze that will hold pride of place in your home. Other new work includes an elegant great blue heron that stands almost thirty inches tall and a whimsical new series of dog sculptures. If you share your life with a Bassett hound, a Daschund or a Greyhound, you'll recognize their distinctive personalities rendered in bronze by Brian Arthur. Brian Arthur began his career in the English pottery country of Staffordshire. 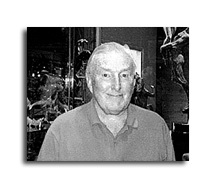 After graduating in sculpture and art history from Southport College of Arts, Arthur pursued his study of form and structure at the Burstein School of Industrial Design. He worked in a variety of media in France and Italy, then collaborated with American sculptor Felix DeWeldon on major commemorative public sculptures, including the Iwo Jima and Harry S. Truman monuments in Washington, D.C. Initially his prefered medium was porcelain, but he eventually turned to bronze and now works almost exclusively in this most durable material. Arthur's bronze sculptures are cast using the lost wax process, polished, then patinaed in rich earth tones. Sometimes resembling fine veined marble, the patina on his bronzes beautifully enhances their composition. Brian Arthur works at his studios in the mountains of Southern California and Devon, England. 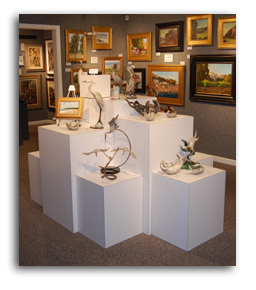 Bring home a pelican sculpture or otter sculpture to commemorate a seaside visit or add a beautiful focal point to your beach house. Emperor Penguin #1- Snow Flake 7"
Emperor Penguin #2- Polar Ice 7"
Heron in Everglades II 17"
Heron on Sand Base 16"
Heron on Sand Base 55"
Pelican, Small Standing (Silver) 13"
Sea Otter with Abalone, Small "Neptune"
Sea Otter with Starfish, Medium "Schooner"
Sea Otter with Starfish, Small "Harbor"